Many years ago a teacher told me that you could steam out a dent in a piece of wood (one where the wood fibers had been compressed, not a where they had been removed) using a wet rag and an iron. This technique was meant for unfinished wood, but unfortunately, most of the wood we deal with in our homes has some sort of finish on it. With some research I learned that this technique can work with finished wood but it depends greatly on the type of finish you are dealing with. So I decided to do a couple of tests to see the results for myself. NOTE: BE CAREFUL! SOME FINISHES MIGHT TURN WHITE WHEN EXPOSED TO STEAM. PLEASE TRY THIS IN A HIDDEN AREA BEFORE DOING IT IN A VISIBLE PLACE. The first test was a on a birch table from IKEA. Although this technique works better on new dents I decided to try to steam out a dent that had been there for quite a long time. 3. With the iron on High apply the iron to the wet paper towel or cloth and make a circular motion, don't keep it in just one position as this might burn the surface of the towel. Make sure there is a lot of steam being generated. Do this for a few minutes and check your results. In my case I did this for about 3-5 minutes. The dent came up almost completely and there was no damage to the finish! My second test was on our hardwood floors. I found a dent that was pretty deep. I followed the same steps as above. Although the dent came up, the surface of the finish had been broken and some dirt had gotten in side the cracks. 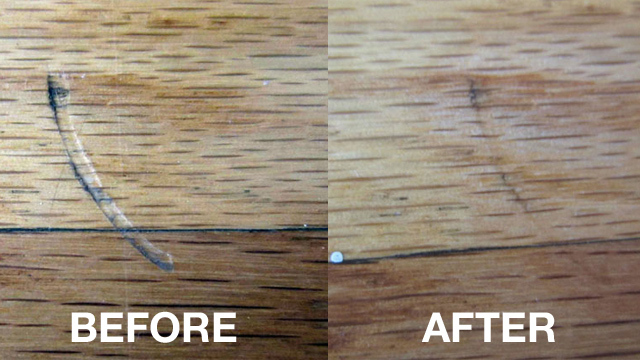 If you know what type of finish you are dealing with you might want carefully sand the area and reapply the finish. Publicado por paspartus en 10:02 a. m.